What is Rough Cut Men? I don’t often make a big deal out of stuff, but every once in a while, I just hit the proverbial end of my rope. In my history, both as a Christian and not, I’ve dealt with a lot of different people. I’ve been the manager of hundreds, the salesman to the people who are building their very first home, and even a coach to 5-year-old soccer players—complete with the fathers and mothers of those players. And along the way, I’ve heard it all, seen it all and probably said it all, too. My latest round of dysfunction reminds me of a scene from Jerry Maguire, that Tom Cruise movie about the professional sports agent who makes a living recruiting top college prospects into the big time. There’s this one quarterback kid, Frank Cushman, who’s being recruited by every NFL team and every agent, and Jerry has him on the hook. The only challenge is that the prospect’s father, played by Beau Bridges, won’t sign a contract for representation. But he does say “My word is my bond” and, “I don’t sign contracts, but what you do have is my whole word, and it’s stronger than oak”. Maguire and Cushman’s dad seal the deal with a handshake. Even if you haven’t seen Jerry Maguire, you can probably guess what happens. Another agent, Bob Sugar, comes in and steals the contract from Jerry and even gets it in writing. It’s NFL signing day, and Sugar has just stolen Maguire’s biggest client. 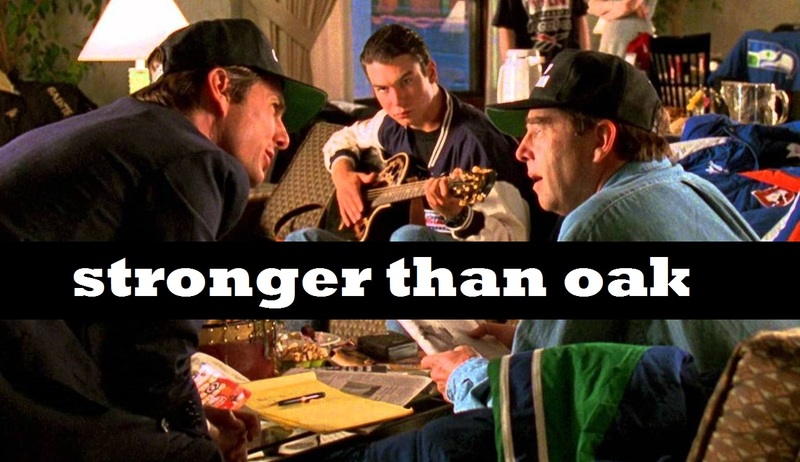 Jerry confronts the quarterback’s father saying, “I’m still sort of moved by your ‘stronger than oak’ thing”. But no deal. Jerry’s out and Sugar’s in. So here’s what I’m trying to get at: Keep. Your. Word. If you say you’re going to do something, do it. If you commit to following through with a task, do it. On time. If you make a commitment to faithfully love your wife until death, do it. If you tell your kid that you’ll be at his game, recital or practice, be there. If you set an appointment to call or meet, keep it. If you screw something up, relationally or even physically, own it. If you have to re-schedule, do it in advance, not as an apology after the fact. This isn’t just because being a man of integrity requires the aforementioned, but keep in mind that other people (aka- your sons, daughters, co-workers, etc.) are going to follow your lead. If it’s okay for us, then it’s okay for them. I’m so tired of living in a society where making excuses and shifting the blame to someone else has become the new “normal”. The root word of “commitment” is “commit”, and I didn’t even need a Greek or Hebrew translation to see it. When we commit, it’s a covenant to follow though. It’s non-negotiable and irrevocable. As a Christian man, I am committed to living as if you could build a ship out of my word. It won’t sink if you rely on it. It won’t even leak. I may fail at a lot of Godly man tests, but my word IS stronger than Oak. David Dusek is founder and director of Rough Cut Men Ministries and author of Rough Cut Men: A Man’s Battle Guide to Building Real Relationships With Each Other and With Jesus. Rough Cut Men has been presented to NASCAR teams, at West Point and the U.S. Naval Academy, at military bases around the world and at hundreds of churches and men’s conferences of every denomination. To find out more about the Rough Cut Men, or to book David for an upcoming men’s event, please check out roughcutmen.com. Copyright ® 2017 - Rough Cut Men Ministries. All Rights Reserved.